In the dim and distant past, when I first arrived at the University of Stirling, I was one of number of research follows and assistants involved in establishing the Institute for Retail Studies under the leadership of John Dawson. One of my contemporaries was Tim Marks, who was doing research on price promotional effects. As one can imagine, the combination of Marks and Sparks provoked some wry – and public – comment, and the fact we were both researching in the retail area made the situation more amusing for others. 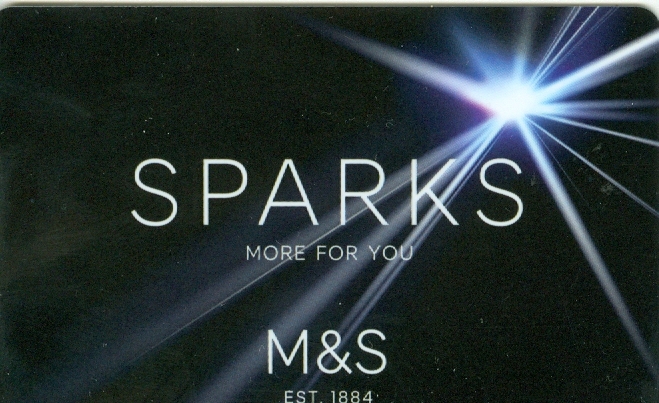 So, the rumours of the last few months of a Marks and Spencer loyalty card called Sparks (well not loyalty as according to the loyalty director (sic) “Loyalty is the wrong word to use, it’s about a new relationship with customers – recognition, relevance, tailored and a conversation. We want to go beyond generic discounts” Retail Week, 16.10.2015, p1), brought some of this back, and made me wish I had been able to trademark my surname. And now the day has arrived. 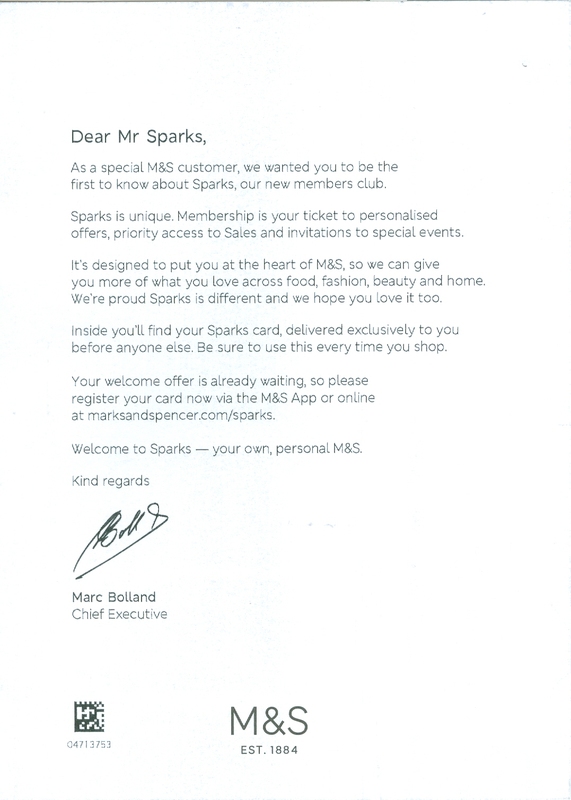 Sparks – with the strapline More for You (well I’ve always said that) is the now formally launched M&S Members Card. “Sparks is different and we hope you love it too”. Please form an orderly queue. Besides providing an obvious string of headlines in papers for people to cut out and pin to my office door, I am more than a little disappointed by the missed opportunity and lack of personalisation from M&S. Surely they could have recognised the mileage in giving a Professor of Retail Studies with the surname Sparks some form of Gold or platinum joining card, or even any recognition that they’ve stolen or subordinated my name? But no, the computer has churned out the standard letter and invitation to me with no bonus or any recognition of the possibilities. Surely anyone call Sparks deserves more? And then there’s the idea itself. it is a members club and not a loyalty scheme – honest. M&S are very keen to stress this. You collect Sparks (please no kidnapping) by spending, reviewing or “shwopping” and the Sparks points (not a word they use much) provide benefits such as short term offers, priority access (previews, sales) and events and experiences. This follows a recent trend of trying to move loyalty on to an experiential rather than a transactional relationship. And you can still get the transactional loyalty discounts/rewards if you have the M&S bank or credit card, and both cards can be used in collaboration. The proof will be in the uptake and use of course, but the scheme seems a little convoluted, the rewards so far underwhelming and the need to use two cards at the checkout (if you want the vouchers) seems rather perverse. But I do hope it works. I am not really sure I am ready for the Sparks axed headlines; that’s just taking it too far. This entry was posted in Experiential, Loyalty, Loyalty Schemes, Marks and Spencer, Membership, Relationships, Sparks, University of Stirling and tagged Experiences, Loyalty Schemes, Marks and Spencer, membership, Rewards, Sparks. Bookmark the permalink.